Back in Print. Winner of the Martha Derthick Best Book Award from the Federalism and Intergovernmental Relations Section of the American Political Science Asscociation. Federal-provincial negotiation is a central feature of Canadian policy making, however much of this process takes place outside public view and goes unreported in the press. In Federal-ProvincialDiplomacy, Richard Simeon uncovers the mechanisms behind the policy negotiations taking place amongst Canada's political leaders and bureaucrats. Simeon undertakes case studies exploring the creation of the Canadian and Quebec Pension Plan, the negotiations around financial and educational policies, and the early steps of putting together a new constitution. 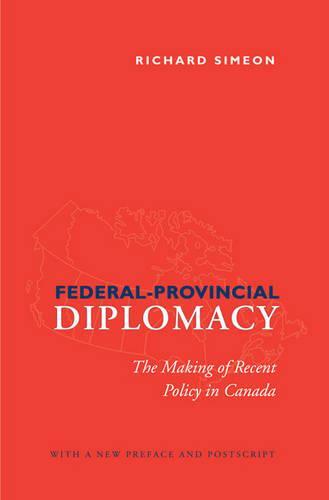 He then goes on to form a framework adapted from the literature of bargaining in international relations.First published in 1972 and reprinted in 1973, Federal-Provincial Diplomacy has become a classic of Canadian policy studies with an influence stretching far beyond Canada's borders. Its importance was confirmed in 2005 when it was awarded the American Political Science Association's prestigious Martha Derthick Award for the best book in federalism and intergovernmental relations published at least ten years earlier. Featuring a new afterword, Simeon's work lives again for a new generation of policy analysts and students of federalism to enjoy and ponder.